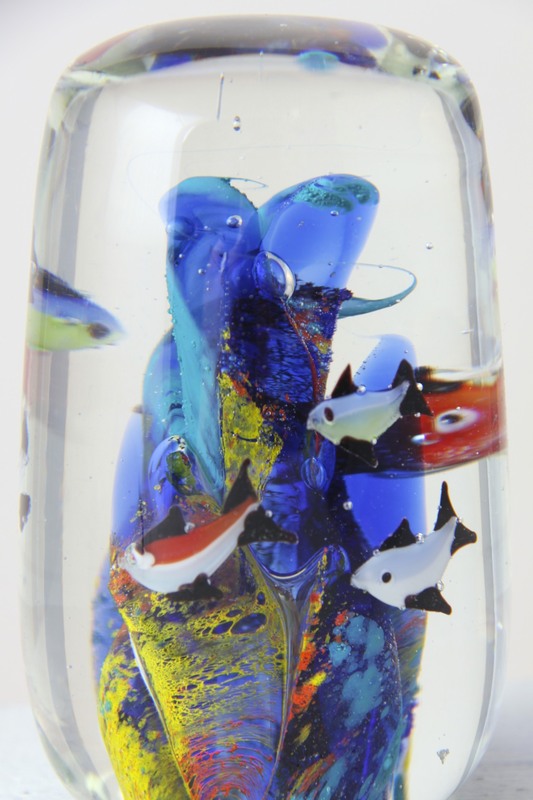 This is a Stunning Aquarium / Seascene art glass paperweight, made in Murano, Venice, Italy circa 1960’s / 1970’s. Unlabelled possibly by Cenedese. A Beautiful piece of Venetian art glass, the large clear glass paperweight has a tapered barrel like form, wonderfully smooth and rounded. Inside is an amazing underwater seascene / aquarium with 6 fish swimming around a coral reef. Incredibly skilled craftsmanship on display, the blue glass coral is embellished with bright colours, spirals organically and trails off into wispy vortexes. Very similar to the renowned Cenedese aquariums blocks by Alfredo Barbini and Riccardo Licata. 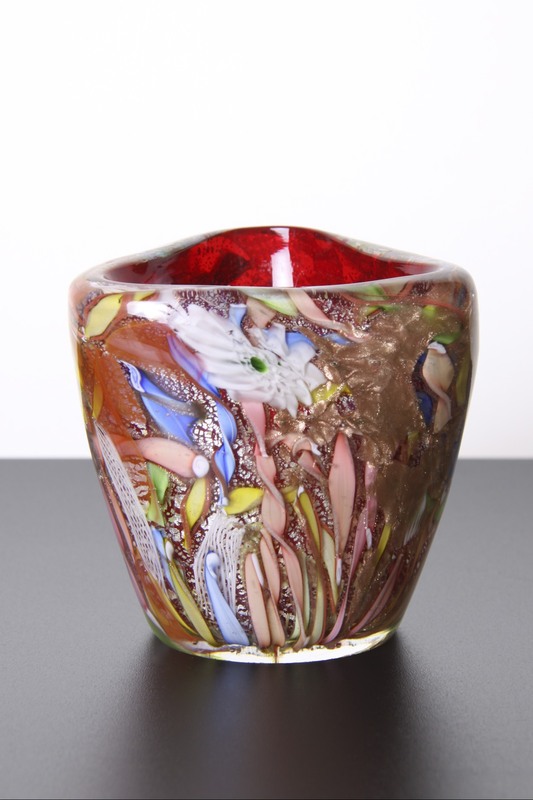 Would make a Great addition to any collection of Murano / Italian / European Art Glass, and would complement any retro, vintage, 60’s, 70’s, 80’s, mid century, kitsch, minimalist or contemporary interior. In Great Condition, no marks, chips or scratches other than the usual age related wear to the base, not noticeable and doesn’t detract on display. Measures 11 x 7 x 7cm / 4.5 x 2.75 x 2.75in. Weighing approx 800 grams. 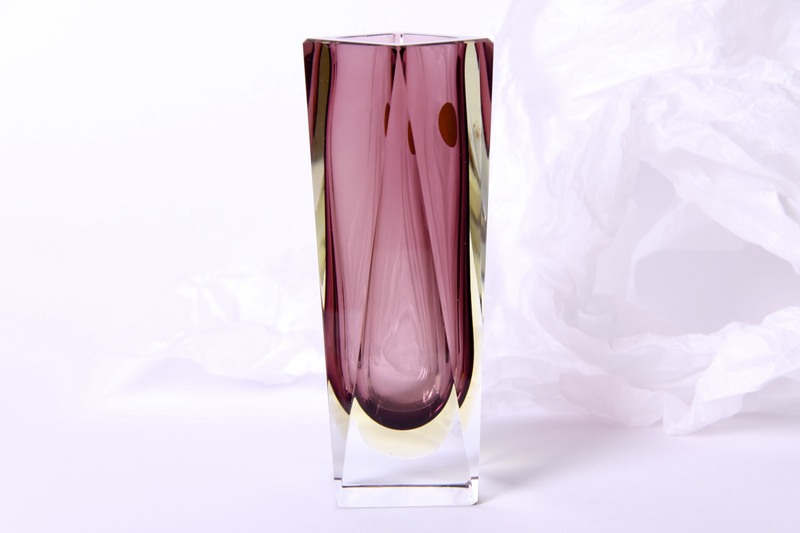 This is a Beautiful Murano Sommerso faceted glass vase, made by Mandruzzato, Venice, Italy circa 1960’s / early 1970’s. A Striking faceted design, beautifully and skillfully hand made, highlighting the best of Murano glass craftsmanship and technique with modern futuristic design. The rectangular form is divided into 8 triangular facets, the clear glass exterior contains a submerged, Sommerso, pink layer highlighted by a halo of pale yellow glass. A Beautiful geometric understated sculptural form which could be used as a single stem vase, desk paperweight or centrepiece, a fantastic space age, retro styled home accessory. Catches the light amazingly through the facets and Sommerso layers. Would complement any collection of art / Murano glass, and would look fantastic in any retro, vintage, 60’s, 70’s, minimal, modernist, mid century or contemporary styled interior. In Excellent Condition, no marks, chips or scratches, still bears the original ‘Made in Murano, Italy’ foil label. Measures 16 x 6 x 6cm / 6.25 x 2.5 x 2.5in. These are a Beautiful Pair of Venetian glass vases made by Mandruzzato, Murano, Italy circa 1970’s. 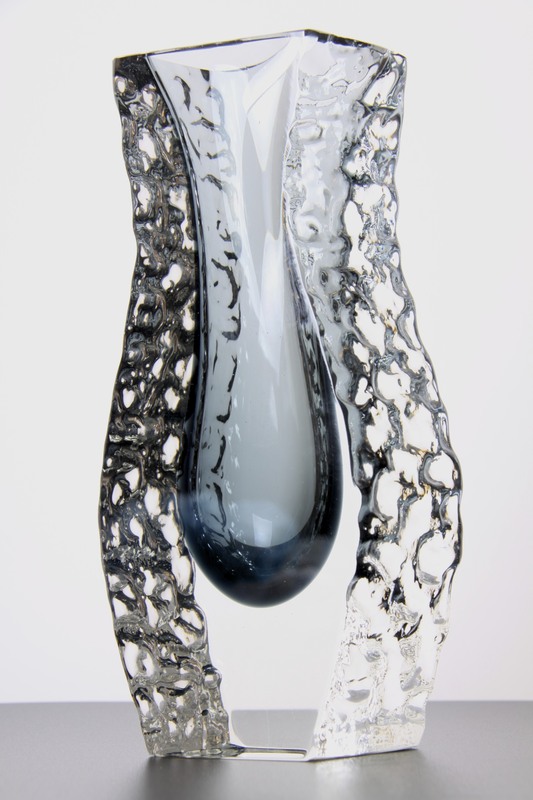 A Stunning Pewter Grey and clear textured Sommerso glass design, originally by Campanella. 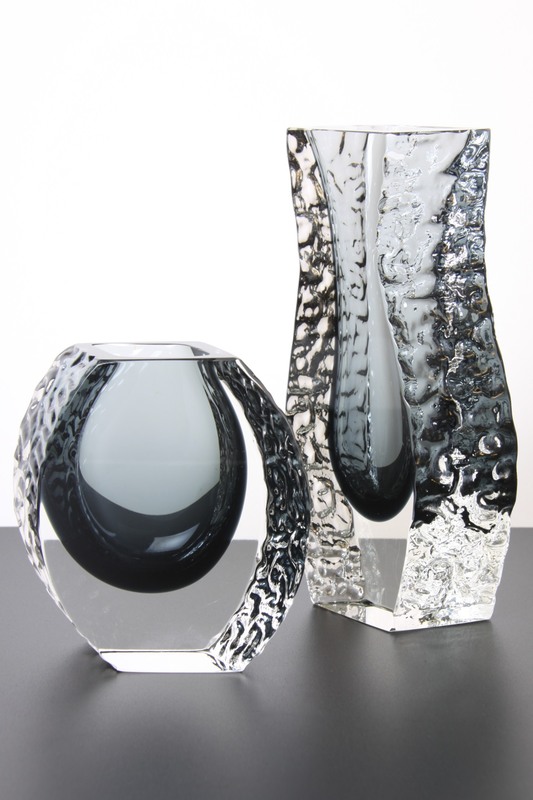 Fabulous pieces of Venetian Art Glass, the stylish steely glass layers encased using the renowned Sommerso (submerged) technique inside a rhomboid and curved and angular and asymmetric textured clear glass design. The edges with their textured pattern like bark / ice contrast beautifully with the smooth sides, catching and refracting the light amazingly. 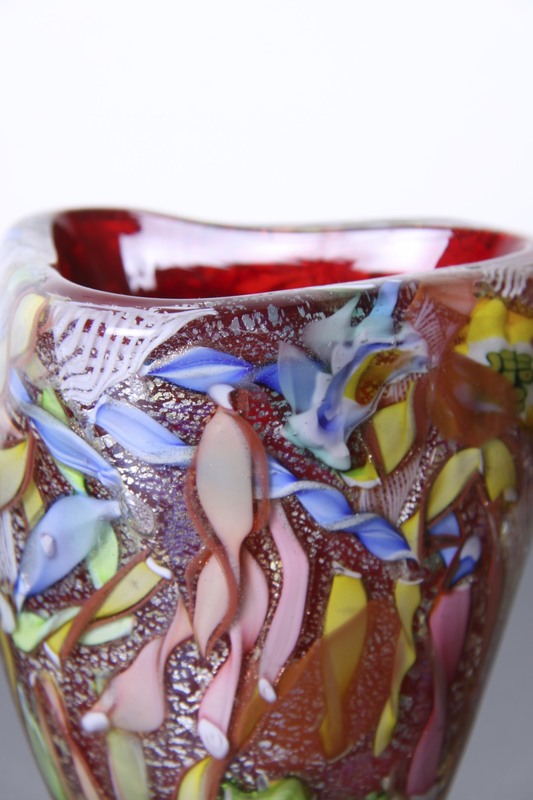 Striking examples showing the skill and craftsmanship of the glassmakers of Murano. 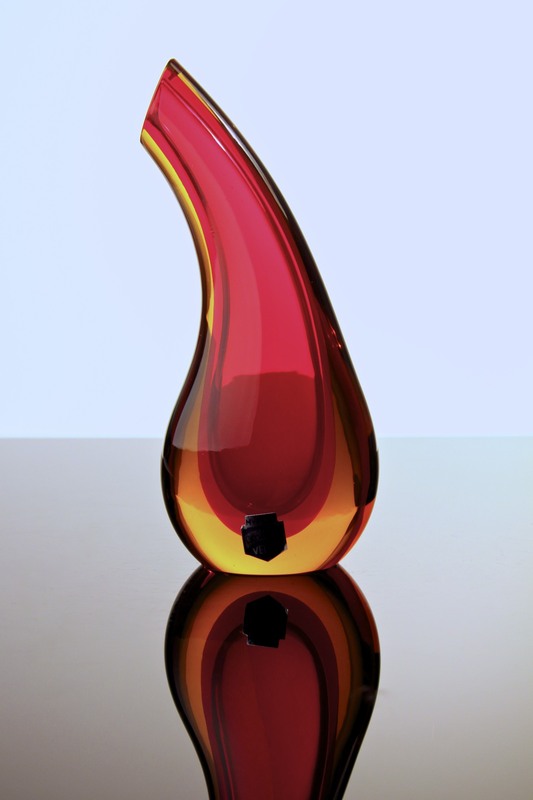 Would complement any collection of Murano, European or Art Glass, and would look fantastic in any retro, vintage, space age, minimal or contemporary interior. Measuring 13 x 13 x 4.5cm / 5 x 5 x 1.75in. and 21.5 x 10 x 5cm / 8.5 x 4 x 2in. 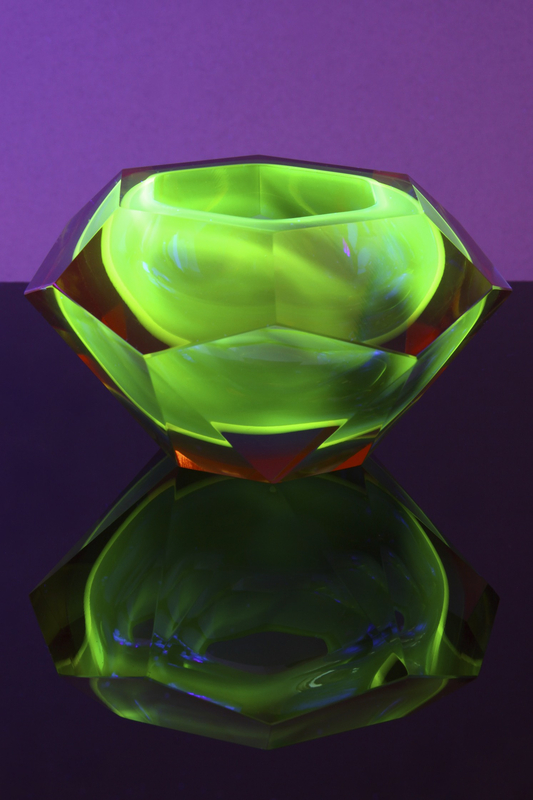 This is a Great Murano Uranium Sommerso faceted glass vase, made by Mandruzzato, Venice, Italy circa 1960’s / early 1970’s. The rectangular exterior (with a very pale pink colour to the clear glass) contains submerged (Sommerso) yellow and green capsules with a round shaped opening. Under UV lighting the layers have a fantastic green glow, due to the Uranium Oxide in the glass! Would complement any collection of art / Murano glass, and would look fantastic in any retro, vintage, 60’s, 70’s, minimal, modernist, mid century or contempoarary styled interior. Measures 15.5 x 4.5 x 4.5cm / 6.25 x 1.75 x 1.75in. Over at my Etsy shop, Christmas Sale until 1st Jan 2013, 10% off all shop items! 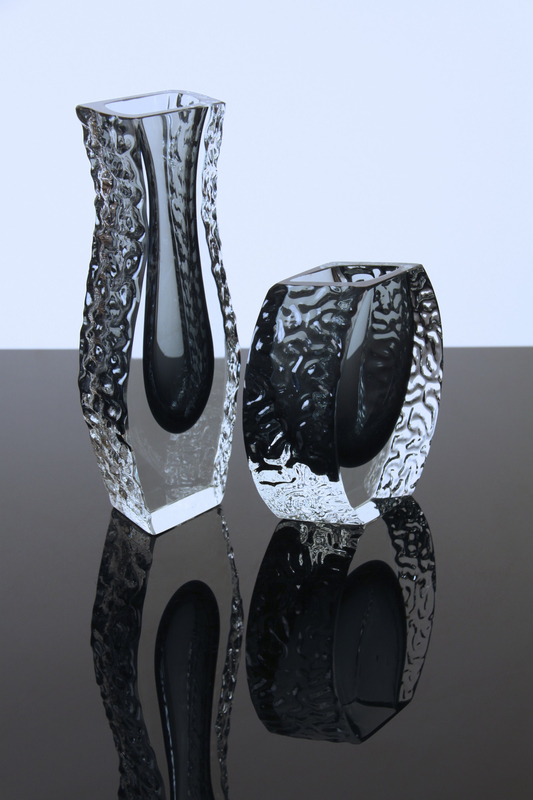 These are a Beautiful Pair of Aseda Glasbruk Swedish Art Glass ‘Jack in the Pulpit’ / Bone vases circa 1960’s. A Stunning retro mid century design, the Elegant Organic form resembling the ‘Jack in the Pulpit’ hooded woodland flower. The Ruby Red long slender stems flare out to the curved hooded rims, they sit on clear glass feet filled with ‘controlled bubbles’. 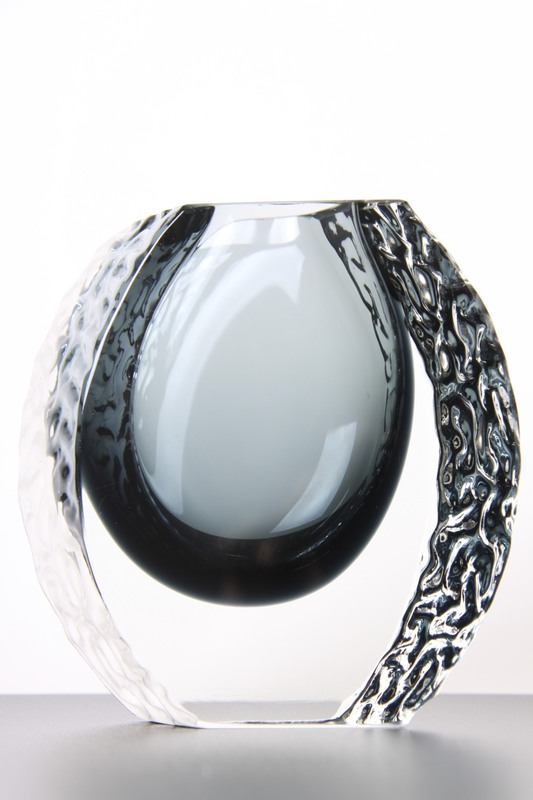 The form and glassblowing techniques used are very similar to Whitefriars and Murano glass, which these are commonly mistaken for. Great Vintage Scandinavian design, that is very reminiscent of styles of the era. The difference in height and shapes of the rims of the pair only adds to their organic natural freeform charm. Would make a Fantastic addition to any collection of Scandinavian / European / Art Glass and would complement any retro, vintage, mid century, sixties, Nordic or contemporary interior. In Great Condition, just the usual age related marks and small fleabites on the bases, nothing visible on display or to detract. Measuring 18 x 5.5 x 5.5cm / 7 x 2.25 x 2.25in. 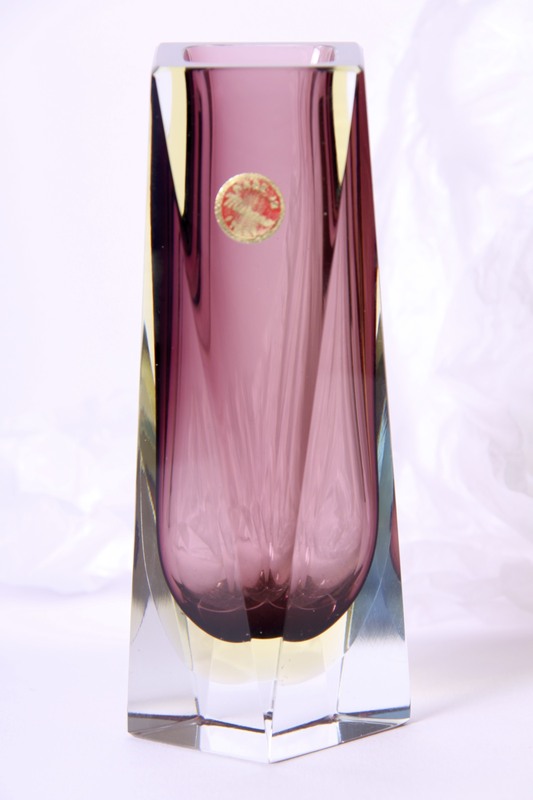 This Cenedese single stem vase, encapsulates everything great about Murano art glass. The beautiful organic shape with its contrasting sharp angled rim marks a clear break from tradition, embracing the space age futuristic styles of the 1960s. 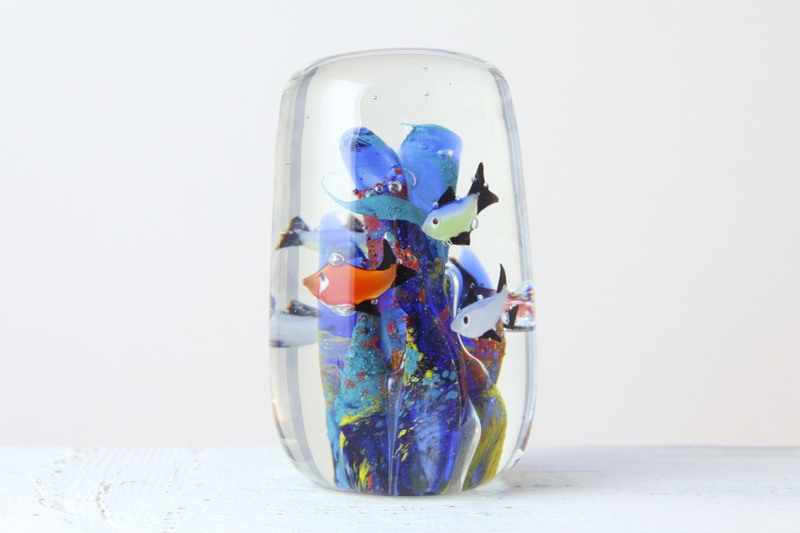 The handmade blown glass is skillfully and amazingly layered using the Sommerso (submerged) technique, creating encased coloured capsules that need no other adornment. It catches and refracts the light beautifully and becomes a sculptural piece of art in its own right.